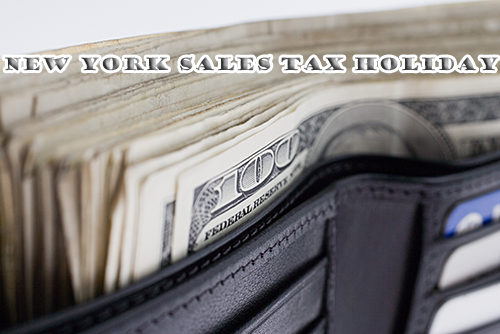 New York Sales Tax Holiday does not currently exist state-wide in New York. Some counties such as Putnam, NY have adopted a ten day tax free week for Back to School purposes though. Clothing and footwear sold for less than $110 is always exempt from State’s 4% sales tax; Together with local exemptions, New York shoppers save more than $1 billion annually. The New York State Department of Taxation and Finance kicked off the back to school shopping season today by reminding New Yorkers that qualifying clothing and footwear purchases are exempt from New York sales tax year-round. While many states offer “sales tax holidays” leading up to the school year, New York has a constant exemption from the State’s 4% sales tax on items of clothing and footwear sold for less than $110. Through this exemption, all shoppers are free from paying the State’s 4% sales tax. In addition, in New York City and the eight counties listed below, clothing and footwear items under $110 are exempt from local sales tax year-round. The savings available in these localities, including State and local sales taxes, is between 7 ½% and 8 7/8%. The state exemption alone saves New York shoppers more than $876 million annually. Together, savings from the state and local sales tax exemptions is well over $1 billion annually. Course textbooks purchased by college students are also exempt from New York State and local sales and use taxes. This exemption is also available throughout the year. Purchases can be made from any bookstore, including college or university bookstores, by mail order, over the internet or by other means. In New York, a statewide sales tax holiday was first enacted by the New York legislature in 1996, enabling the first tax-free week in January 1997. Local governments in New York were given the option of whether or not to participate; most declined.